Below is Chapter 4 of the Foresight Africa 2017 report, which explores six overarching themes that provide opportunities for Africa to overcome its obstacles and spur inclusive growth. You can also join the conversation on Twitter using #ForesightAfrica. The year is 2063. Celebration is in the air across Africa’s cities—many states are celebrating a century of independence from colonial rule. The significant outlier—Liberia—enjoyed its bicentennial under the banner of “Land of the Free” in 2047 using the year of declared independence. Africa is now—willingly—the world’s most important supplier of labor, much of it highly skilled. The Africa Union’s (AU) celebrations of the 50-year “global strategy to optimize Africa’s resources for the benefits of Africans” merge into the general sense of jubilee. Kinshasa-Brazzaville (joined after a referendum) and Lagos are now the first- and third-biggest cities in the world; Dar es Salaam, Lilongwe, Niamey, Nairobi, and Khartoum all vie for spots in the top 10. Africa’s many global cities are household names. The world’s cycling capital includes paths through rehabilitated equatorial African forests; many of the most livable cities are scattered across the continent; and, after major infrastructure investment and free movement, travel between African cities is generally smoother than between, say, London and Paris. Africa’s bold urbanization strategy brought more benefits to Africans than could ever have been expected. Africa was the only region to provide a coordinated response to what should go into the United Nations’ New Urban Agenda. Back in 2016, Africa was the only region to provide a coordinated response to what should go into the United Nations’ New Urban Agenda. The action-oriented document set global standards of achievement in sustainable urban development. The AU swiftly harmonized the strategy with Agenda 2063, Africa’s action plan and vision for a united and prosperous future. The move was widely celebrated by the global community: Africa was finally recognizing and embracing its urban future. At the same time, what was overlooked by the international community was the subtle power shift. Africa was no longer following, but leading, on global policy initiatives. Involvementin the New Urban Agenda, while important for Africa, has been merely a stepping stone towards owning its (urban) future. After all, Agenda 2063 is an African document. There are more hints to the wind of change. Burundi, the Gambia, and South Africa’s rejection of the International Criminal Court, arguing that Africans were being unfairly singled out; campaigns like #RhodesMustFall in South Africa to “decolonize” education; pan- African internet memes clarifying that “Africa is not a country;” and even the AU’s desire for visa-free travel across Africa for all Africans, all suggest an eagerness for Africa to redefine how it engages with itself and the world. That Mpho Parks Tau—Johannesburg’s former mayor—was elected as president of the global United Cities and Local Governments signposted a growing understanding of Africa’s future clout. In essence, Africans are increasingly saying that international bodies can’t be relied on to fairly communicate Africa’s needs or Africa’s context. Some have gone as far as suggesting these bodies effectively maintain the status quo of colonial power, calling for African (or at least Global South) institutions to be built instead. While not acknowledged at the time, Africa’s involvement in the New Urban Agenda has been simply part of repositioning itself towards greater say in global decisions; it is no longer necessarily what the agenda means for Africa but rather the other way round. That UNHabitat is headquartered in Nairobi may have been remarkably far-sighted: Africa is gearing up to run (and establish) international bodies. However, Africa will only achieve this future if it has attractive cities, so it is appropriate that the continent is taking the lead on this issue. However, Africa will only achieve this future if it has attractive cities, so it is appropriate that the continent is taking the lead on this issue. The New Urban Agenda suggests such cities are fairer for people and good for the environment. They are well-planned, housing is affordable without being spatially segregated, inhabitants are well connected to opportunities and each other, walking is both possible and useful as sprawl is contained and pavements are prioritized, pollution is low, energy is sustainable, technology is used creatively, and everyone is welcome (except possibly for criminals as there’s an expectation that these cities are safe). Almost all of these are in some way related to urban form. Africa already has advantages. While some people travel very long distances to work, it has arguably the most sustainable modal share: More than 70 percent of trips are done by walking and cycling in many African cities. Rapid urbanization provides an opportunity to fill in gaps in the urban fabric and densify cities to improve accessibility. Higher urban densities can improve service delivery efficiency, promote urban vitality, and facilitate more sustainable public transport, walking, and cycling. These advantages depend, however, on effective city management and urban design that minimize the negative costs of congestion and pollution. Africa’s limited energy infrastructure coupled with its enormous renewable energy potential provides a clear path to cleaner cities, provided industrial and modernization policies don’t encourage mode shift to private cars as has happened elsewhere. Dar es Salaam and Kampala are imagining fly-overs that’ll crisscross their cities to resolve congestion while providing infrastructure seen as critical for economic growth. New York had similar modernization ambitions in the 1940s, yet not realizing them doesn’t seem to have negatively affected growth in the world’s second-richest city by GDP. African cities should carefully review the potential and costs of reshaping their cities around new infrastructure. Other cities around the world have found that big highway projects can cause congestion because of the effect of induced demand. In addition, they may also lead to increased inequality as it is frequently easier to clear poorer areas, like slums and even established informal areas, to make space for roads. Severance, where roads cut off interaction between communities, may be another risk to building socially inclusive cities. In years ahead, Africa should certainly prioritize transport infrastructure; however, it should ideally focus on putting people closer to opportunities first and making sure most inhabitants can both share and benefit from increased connectivity. 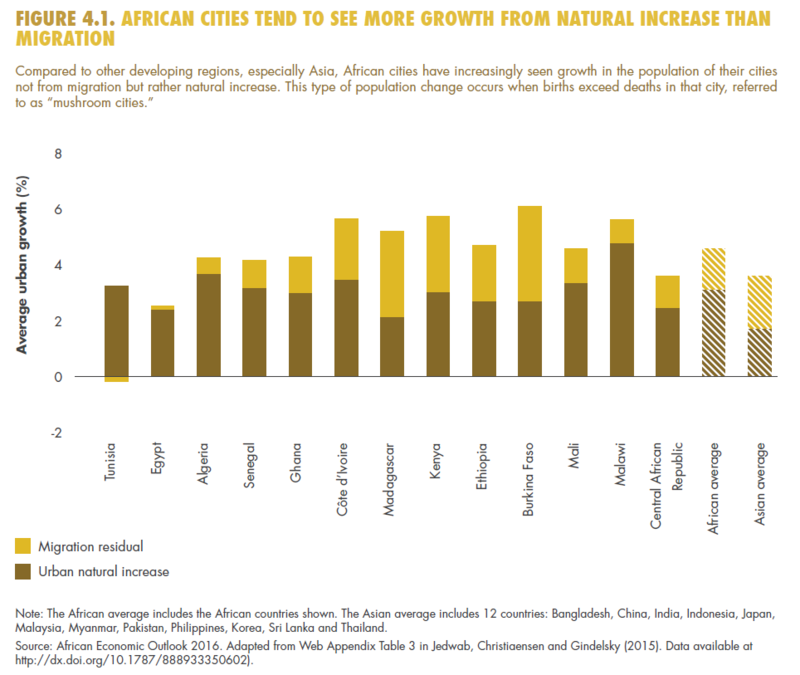 Without a clear vision for how to grow cities to accommodate half-a-billion people over the next 20 years, Africa’s cities will continue to sprawl. Densification of African cities offers both challenges and opportunities. Kigali in Rwanda is looking to put people closer together and tackle housing affordability by enforcing strict landuse policies. High-density flats also avoid scarce land being gobbled up by single-story homes. However, it is one of Africa’s smallest countries: Many other countries don’t have the incentive to not waste land. (For example, neighboring Democratic Republic of the Congo is two-thirds the size of Western Europe.) Given that Africa has an incredible window in which to densify cities to make sure people are both close to each other and to opportunities, the biggest risk is abundant and cheap land (although large plot sizes make them seem expensive). Without a clear vision for how to grow cities to accommodate half-a-billion people over the next 20 years, Africa’s cities will continue to sprawl. However, typology isn’t the only factor that impacts social inclusion and the environment. Africa is largely un-zoned. While zoning can certainly increase the collective imagination and sharpen the vision of what is possible,mono-functional zoning simply increases the burden of travel by putting people far away from opportunities. It may also be less resilient to change, more prone to speculation (something the New Urban Agenda is opposed to), and more likely to support unattractive, deadly streets. Smaller, tighter blocks— often grown organically or informally over time—tend to support more dynamic street life. While not romanticizing slum conditions (Africans on average have better access to mobile phones than toilets), many informal areas may already have some of the DNA needed to build more attractive cities. Africa’s urban future will benefit from better planning, but the risk is that the pendulum swings too far and that cities are over-determined, unable to adapt to change, and lacking in creativity. This leads arguably one of the biggest risks facing Africa’s future. Throughout history, cities have flattened “slums” to later regret the loss of value. Slums and poorly serviced and informal areas are often demolished by well-meaning governments and replaced by typologies and street patterns that are less able respond to current and future needs. Clearly, Africa’s urban future will benefit from better planning, but the risk is that the pendulum swings too far and that—with the promise that planning and better architecture can take Africa from poor to rich—cities are over-determined, unable to adapt to change, and lacking in creativity. Many experts—pointing to examples like the Chinese-built city of Kilamba outside Luanda—believe Africa’s cities will be built by foreign interests. The lack of skills, institutional capacity, and finances present a significant challenge to Africa’s urban agenda. The solutions to these problems may well be unexpected. As some advanced democracies politically close themselves off to the world, a shrewd mayor could rebrand the most culturally diverse continent as a haven for those desiring more open politics, potentially attracting a broad range of skills, while some devolution of fiscal and decision power to increasingly important big and small cities may provide fertile ground for training up new leaders. The AU, emboldened by the success of mobile money in East Africa and taking advantage of a young early adopter population, may move to introduce a common cashless currency. This could make the informal/formal divide far less relevant, help streamline burdensome taxation regulation, and ensure Africa stops being a net creditor to the world (when including illegal financial outflows) by making it more difficult to siphon off money offshore. Africa is likely to become less willing to keep subsidizing polluting nations unless it finds out that this arrangement is somehow good for Africans. Africa has so little built today that its trajectory might look quite different from what’s come before in other parts of the world. Some smart city manager may even use evidence of the link between urban form and emissions to trade carbon credits to fund better city making. A billion more people will be living in Africa’s cities by 2063. The world certainly has a vested interest in ensuring Africa remains the most sustainable region. However, Africa is likely to become less willing to keep subsidizing polluting nations unless it finds out that this arrangement is somehow good for Africans. Given that urbanization is partly caused by the disproportionally high effects of climate change on Africa, this seems unlikely. 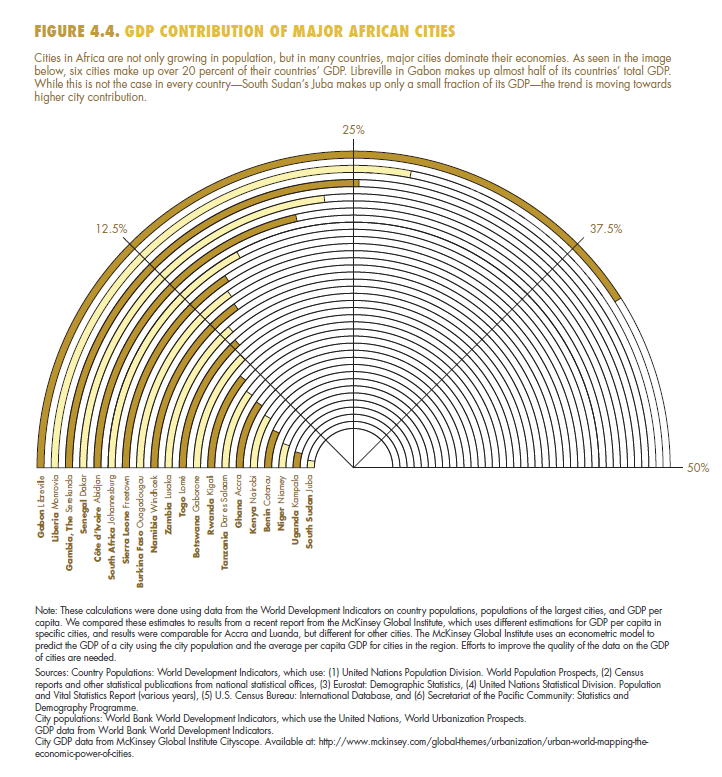 Expect Africa’s cities to make bigger demands on global players.